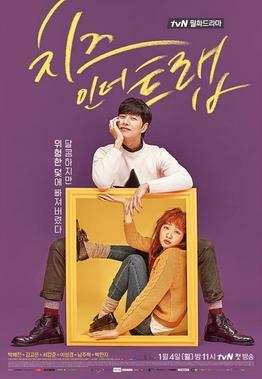 Cheese in the Trap is about Hong Seol (Kim Go Eun), a hard-working college student whose life is turned upside down by his senior, Yoo Jung (Park Hae Jin). From their first meeting they did not get along. 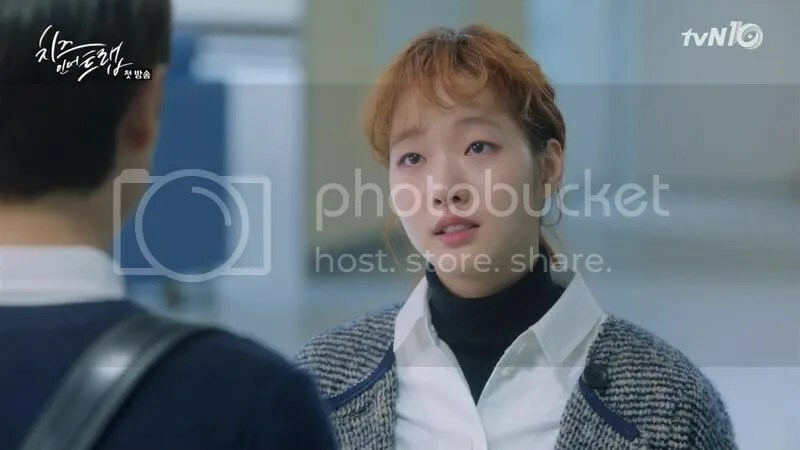 Later it seems that Yoo Jung is deliberately making Hong Seol’s life hell, but after a year when she comes back to school he is suddenly being nice to her… What is going on….? This is not your typical school romance drama. No way. The thrill and mystery surrounding Yoo Jung is always around. And I love it. Meet the sunny side of Yoo Jung. Played by the talented Park Hae Jin, he is a sunbae loved by everyone. He is good-looking, rich, a perfect student and is nice to everyone. The drama keeps us guessing about his true character. One moment we see the sweetness of him and the next moment he gives us a glare and a creepy smile. There is just so much mystery surrounding him that there is no way that we can make out is he really a good guy that is just misunderstood and troubled or is he a manipulative psychopath. That is the thing I love the most about this drama. We are kept guessing about his motives and actions, and stalking is not romanticized here. 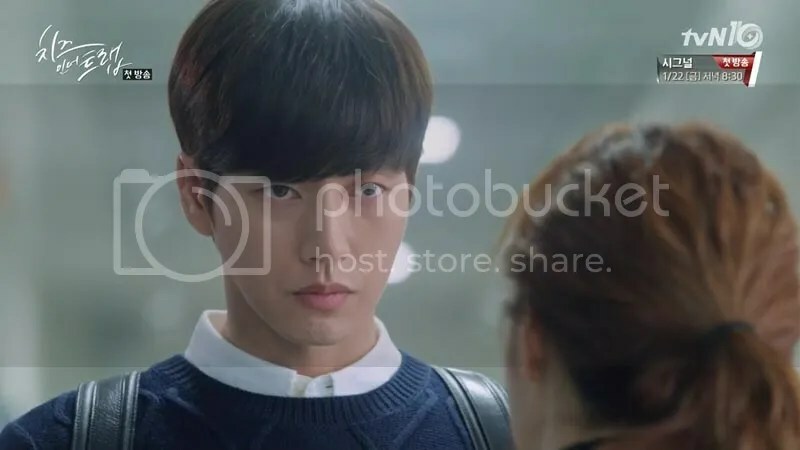 The music and Park Hae Jin’s ice-cold stare make sure of that. Park Hae Jin’s acting is top-notch. I can’t wait for more episodes so that we get to see more of his character. I myself am loving this refreshing approach to the main leads. I’m never sure about Yoo Jung; one second I think he is sweet and the next he is down right creepy. Hong Seol is a girl who although tries to be nice to everyone, just gets tired with life. She is a very life-like character. I am seriously seeing myself in her so much sometimes that it is scary. When Yoo Jung suddenly stars to be friendly with her she is at a lost. She starts avoiding him but it’s no use. Yoo Jung changes classes to be with her, follows her and continuously asks her out to eat. As time goes by and a few misunderstandings are solved she starts to accept him more. His sweet is showing here. Still, in the back of her mind she knows that something is weird here, but she can’t help getting involved more and more with him. Let’s look at some of the side characters. Bora is Hong Seol’s best friend. 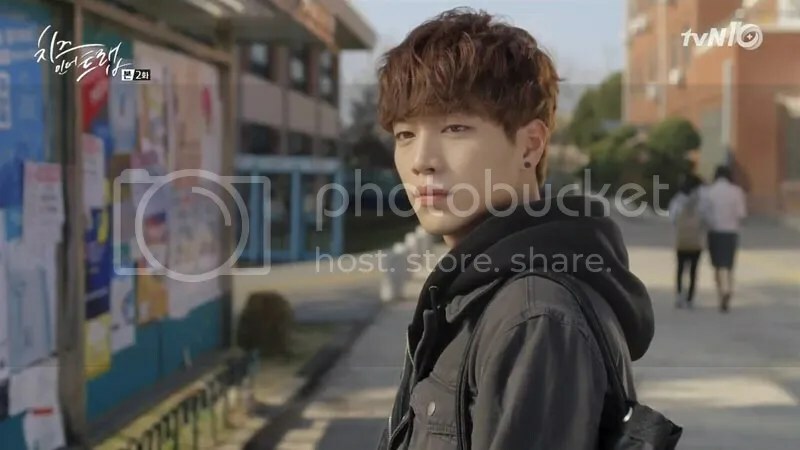 Also in the mix we have the cute Eun Taek, a guy who likes Bora. Together the trio is fun and is a nice add to the drama. Meet Baek In Ho. A character who has close ties to Yoo Jung and looks like that he is going to complete the love triangle here. Unlike Yoo Jung who is silent and calculating In Ho is an outgoing and talkative guy. He has a humorous side to him too, but he carries a grudge against Yoo Jung. He starts to get closer to Hong Seol much to Yoo Jung dislike and testosterone is thick in the air. I give serious applause to the writer. This show is refreshing and exciting. The main leads are exciting, well written and fit together beautifully in the show. In a way they are like day and night but they also are so much like each other. For me, the star of this drama is Park Hae Jin as Yoo Jung. The coldness and his calculating and calm way just keep me guessing about him. He is a wonderful change to the usual kdrama lead. Love love love him. So far the drama is amazing in all aspects, let us all hope that it’ll stay that way too! 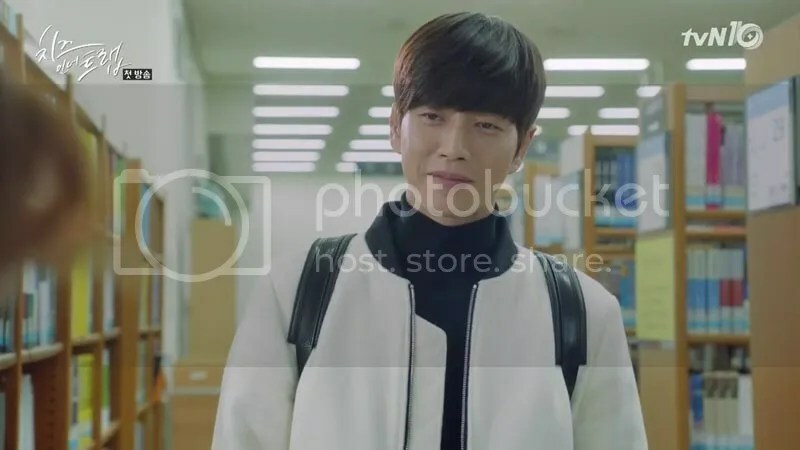 What are your thoughts on Cheese in the Trap? Are you crazy about Yoo Jung’s character like I am? Read my article In Defense of Yoo Jung Sunbae here! AAH! I love this show as wel! Its so different from anything i have ever watched. I love Yoo Jung sunbae but he creeps me out too. I was reading this comment which said that they suspected Yoo Jung sunbae to be a psychopath. so i looked up characteristics of one and honestly…i think he might be one. the article said that psycopaths tend to be intelligent and charming. “They may pretend to be interested in you, but in reality, they probably don’t care. They’re skilled actors whose sole mission is to manipulate people for personal gain” It also said that they tend to be cold hearted and calculating. have you seen the latest episode where he beats up this guy without really showing any emotions? maybe calling him a psychopath is far-fetched but…the description matches, doesn’t it? I agree with you! Yoo Jung sunbae definitely has some psychotic characteristics, there’s no question about it!! I think his two sides are what makes me so addicted to this drama. I am never sure of him. Yes I watched the episode where he beats up the pervert but that scene (along side to me thinking that he is crazy) made me think how he really feels about Seol. Does he really like her like he seems to in most of the episodes or is it just his way of searching for a soul mate?? His eyes looked at the man like he wasn’t a person to him at all and at the same time I thought that he looked lonely. He is completely different around Seol; he never seems to want to anger or hurt her in any way, he is just like any boyfriend. What I mean is that he is that he is calculating and manipulative in everything -we just don’t see all the scenes. I mean the way Seol’s stalker “just” disappeared…. He is always a player in the background. 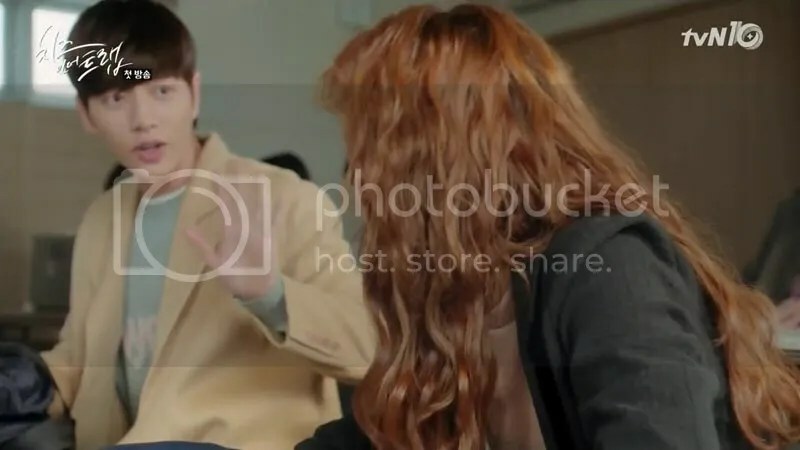 and again it makes me think that is he just controlling Seol and her emotions that way too or is he sincere towards her…? I definitely think he likes her a lot. I have no doubts about that. But he’s a really complex character plus we don’t know the whole story yet. But yeah, he does seem to be a player in the background aand he does want to be in control over the fate of their relationship as well as other things.